The Civic has swept-back body contour lines that create a "forward-in-motion look," Honda says. Honda's latest Civic benefited from the largest development program for a single model in the company's history. 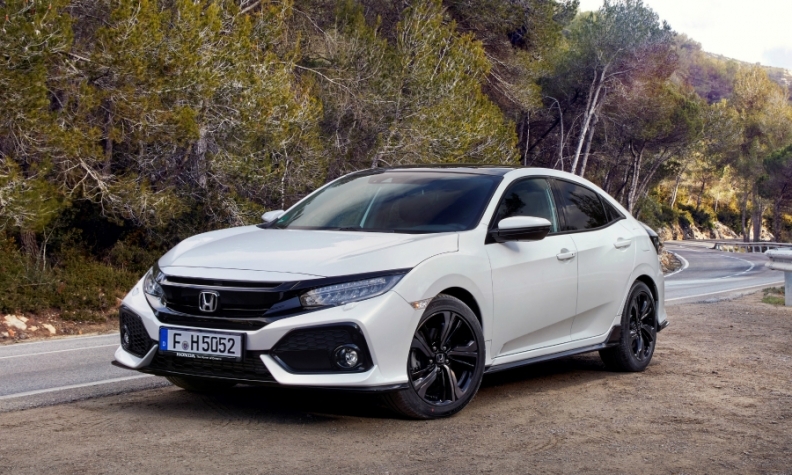 The five-door hatchback is the sportiest Civic to date with significant upgrades to its driving dynamics, interior quality, safety and fuel efficiency, according to the automaker. "We made more improvements and added more innovations than ever before," said Philip Ross, Honda Europe's senior vice president. The Civic has grown by 140mm to 4520mm, making it one of the largest cars in Europe's compact segment. The Civic is underpinned by a new unibody platform that is 16kg lighter than the architecture used on the model it replaces. The new platform also has 52 percent more torsional stiffness, which reduces noise and vibration significantly, Honda says. At 4630mm, the four-door sedan variant is longer than the hatchback and Honda hopes it will attract customers looking for larger cars, including former Accord owners after Honda dropped the midsize model in Europe. Ross said the Accord was dropped because most midsize cars in Europe are part of business fleets and Honda does not compete in that sector. The previous-generation Civic hatchback was built in nine factories on four continents. The new Civic hatchback will be produced only in Swindon, England, and exported globally. The high-performance Civic Type R variant, built in Swindon, will be sold in the U.S. for the first time. The Type R has a 310-hp, 2.0-liter engine that matches the power of the new VW Golf R. Ross said about 15 percent of Civic buyers chose the Type R in the outgoing generation, which is above average for high-performance compact cars. The Civic sedan will continue to be built in Turkey for European markets. The Civic Tourer wagon is being dropped. The Civic was Honda's best-selling model last year in Europe with a volume of 44,870, just ahead of the CR-V's 43,431 sales, according to data from JATO Dynamics. The car finished No. 19 in the compact segment, JATO data showed. Technology: Advanced safety equipment prevents the car from veering out of its lane and adjusts speed if the system predicts vehicles in neighboring lanes on the highway are likely to cut in. Engines: The Civic is Honda’s first European model with new downsized gasoline engines – a 129-hp, 1.0-liter three cylinder and a 182-hp, 1.5-liter four cylinder. Later this year Honda will offer its new 1.5-liter diesel. Connectivity: The Civic offers Apple CarPlay and AndroidAuto for the first time. What's good: Driving comfort and quiet interior. What's bad: Poor rear view visibility.